Safety first – this must be a priority in any establishment. Schools, commercial buildings, hospitals and any other establishment should always have a written Business Action Plan for emergencies. 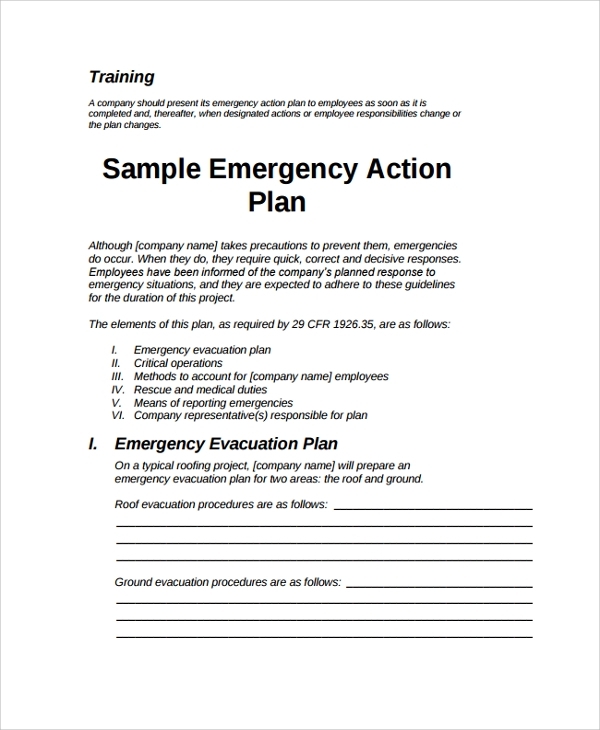 Any organization is required to have an emergency action plan that must be displayed on the job site. It must have a detailed step by step process to follow in times of emergency. 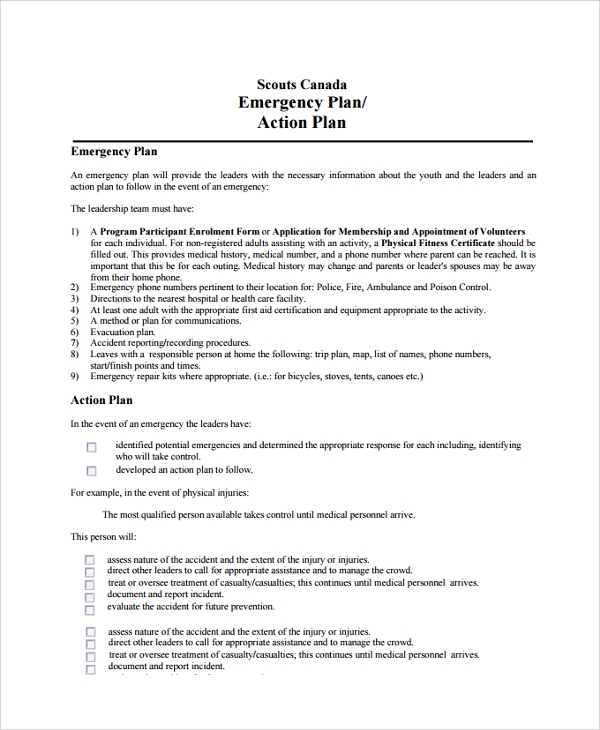 Emergency action plan includes information related to who must do what, whom to notify and the place of emergency stocks. This type of emergency action plan is designed for fire prevention. The plan provides the purpose, scope, cancellation, background and action. 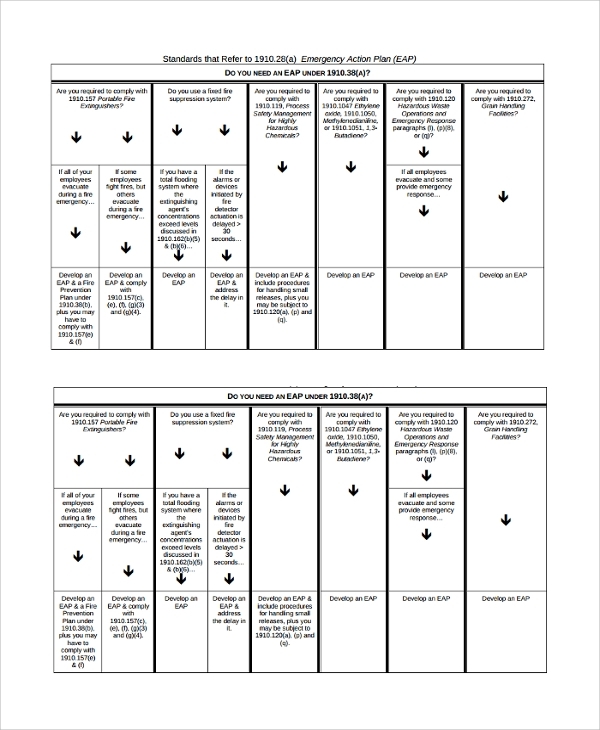 This action plan is presented in a simple and basic way. The entire information written on the plan provides the very best approach to deal with a fire emergency in particular workplaces. This type of emergency action plan is clean and simple. The plan is designed by the coaches in order to respond to emergency situations. Once an emergency would occur, you can be ready anytime to respond to the situation. This is being prepared for the working site to address emergencies. Emergency action plan is elaborate and simple. Construction sites are known to be the danger area. Thus, this type of emergency action plan is applied to address possible emergencies that may occur in the construction workplace. 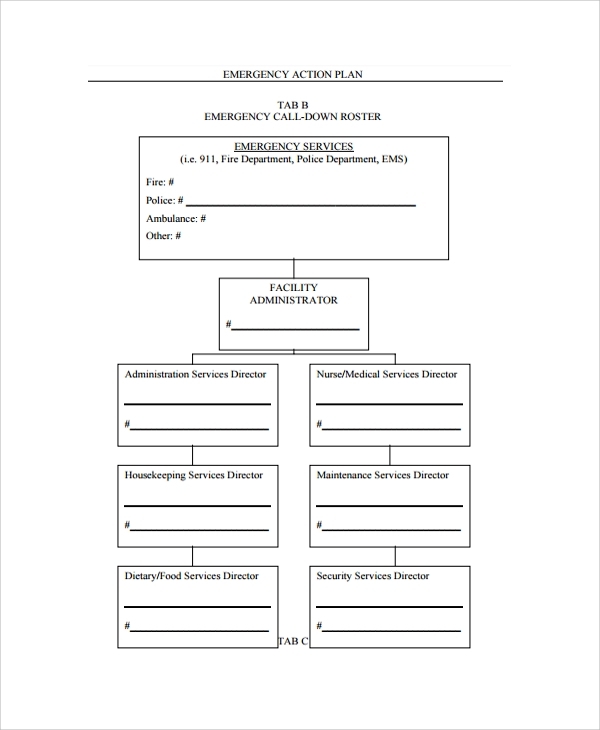 The template covers a written plan to address emergency situations without delay. It covers the safety method to perform once an emergency may occur. 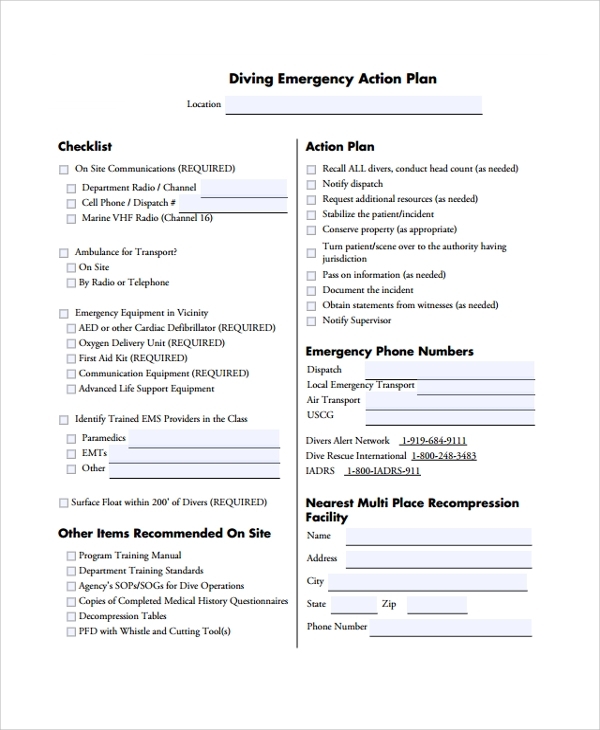 This type of emergency action plan is designed for divers. Diving is naturally risky and divers should be ready to assist any emergency situation. So, a business resort must be operated well with a diving emergency action plan. The plan has a written emergency action plan for the safety measures if any possible emergency occurs. 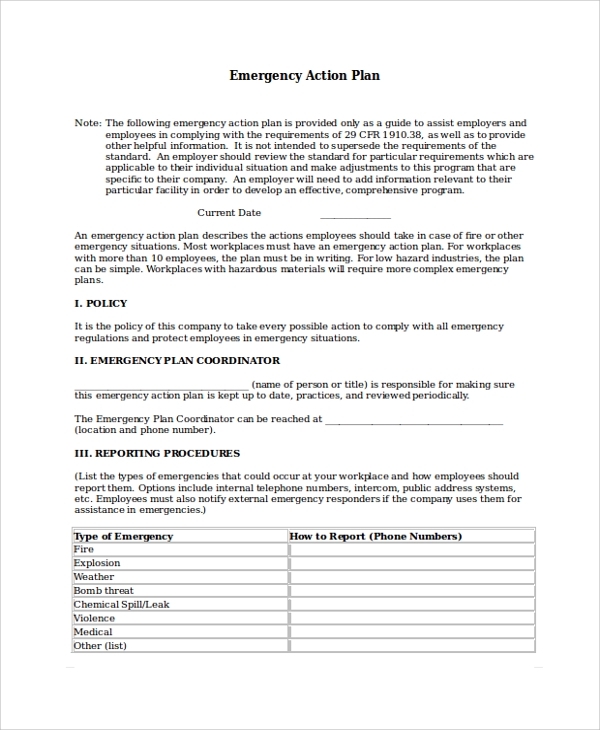 Emergency action plan facilitates and organizes employee and employer actions throughout workplace emergencies. A well developed emergency plan leads to less severe harm and less operational damage once an emergency occurs. The osha emergency action plan is a requirement for emergencies. EAP is used to prepare everything such is organized for evacuation, prevents injury and is less risky. Once this is prepared, employees will understand their responsibility and roles once an emergency occurs. The employer must make use of this as one of the best safety measures at the workplace to protect employee injuries and severe structural damage. 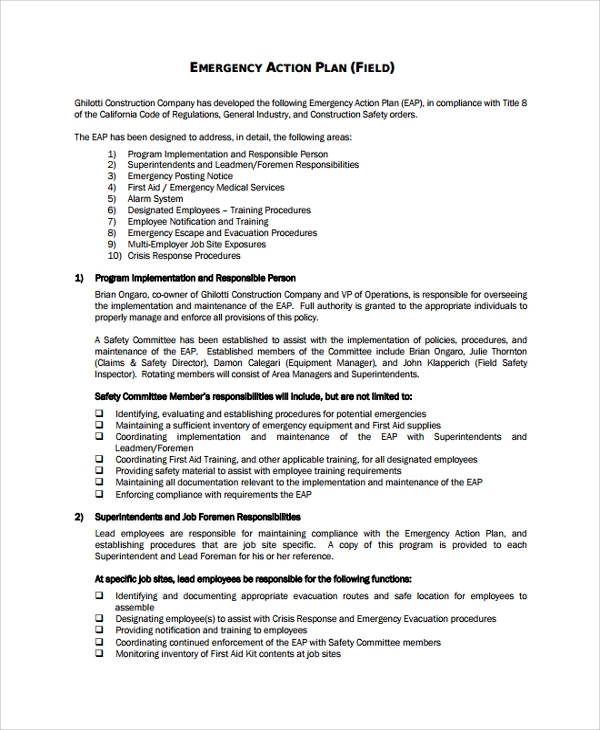 Emergency Action Plans help to describe how employees should respond to any kind of emergency that will be taken into account at the work site emergency system and it’s structural features. When do I need an Emergency Action Plan? Almost all businesses need an emergency action plan. Once fire extinguishers are required or must be provided at a workplace or once anyone will evacuate throughout an emergency or fire, an emergency action plan sample is extremely applicable. You need an emergency action plan to identify if the business you are operating in, is risky or not, as long as it is a working site. Safety is very important in a workplace, this is to ensure that everything must be safe after an emergency occurred. Employers are also required to have an EAP, and this is common in any operating establishment. There will be several Action Plans to be taken during emergencies, so you need to be prepared in cases like this. How to create/write an Emergency Action Plan? 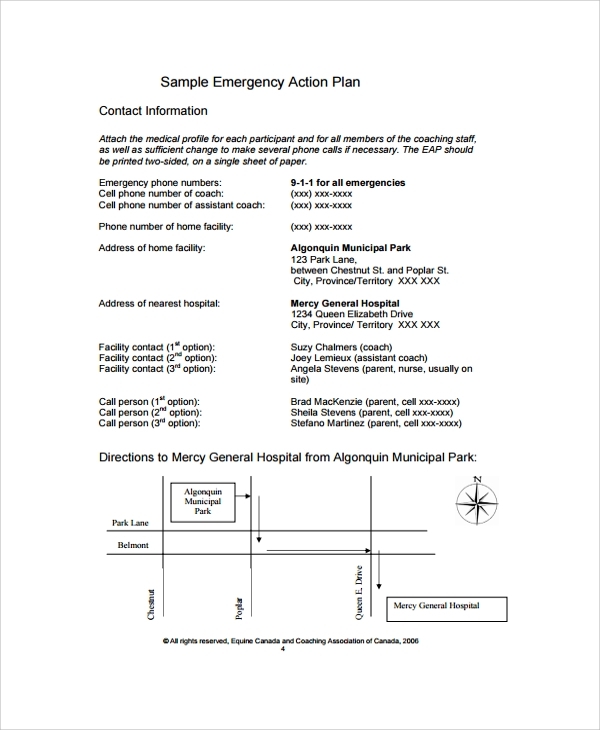 Upon creating the plan, here are the things that must be pointed out in order to define the emergency action plan, and mention the emergencies that require an EAP, including key components of the EAP, escape routes, evacuation procedures, floor plans, reporting and alerting the authorities, alerting the staffs and visitors, accounting for everyone after EAP completion and others. An Incident Action Plan is extremely applicable for businesses and establishments. Thus, this emergency action plan must be presented. The written plan is available in a Word Doc and PDF format and these files are printable and downloadable. There is nothing more than our safety, thus this file is a perfect presentation, which is very much functional during emergencies.